I’ve been wanting to make this dish for a while. 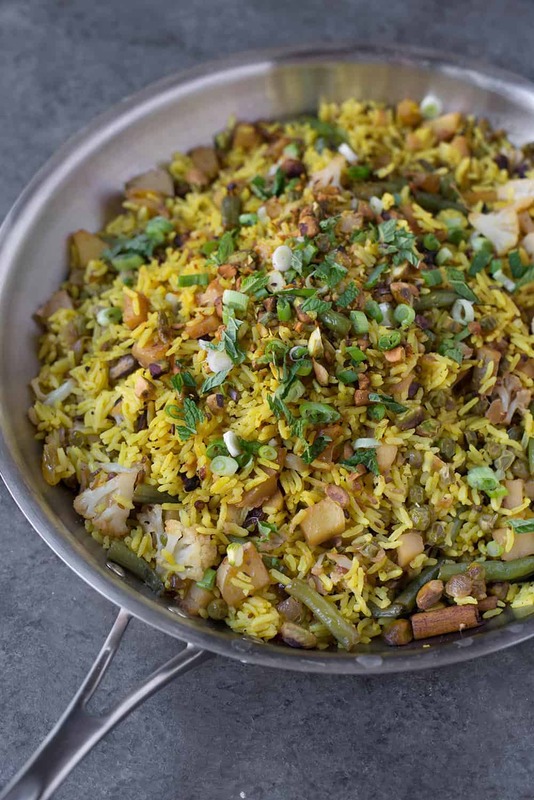 Vegetable Biryani, BL’s favorite take-out, has been my unicorn recipe for the past few years. It’s the one meal he asks for over and over again and of the 15+ different versions I’ve tried, they all fall slightly short of what we get at our favorite restaurants. It wasn’t until we ordered another version a few weeks ago that I figured out what I had been doing wrong. My biryani tended to clump together, mostly because I had cooked the vegetables first, then added in the rice and simmered until done. While the flavor was always delicious, it always looked homemade. I could never quite figure out why mine didn’t resemble what we order. Here’s the trick: cook the rice and the vegetables separately, then add together at the end. While this may seem like a no-brainer, it was an ah-ha moment for me. For perfectly fluffy rice with individual grains, make sure to rinse the rice a few times before adding to the pot. I usually do this in a fine mesh sieve for ease; the excess starches should rinse off fairly easily. You might need to visit a well-stocked grocery store to grab some of the spices. I know it’s tempting to omit things if you don’t have them, but not for this recipe. I’m a huge fan on Penzey’s spices and they usually have online specials and deals if you don’t have one in your area. If there’s one thing I’ve learned about cooking, it’s that your spices can make or break your dish. While I don’t follow a strict schedule for tossing spices, I do advocate for buying in small batches so they rotate in and our frequently. Quality also matters and I think it’s worth spending a little bit to ensure your spices are fragrant. No use in spending money on other ingredients if you use old spices. The other bonus of buying spices? You’ll tend to use them more often! I hear this so often from clients; they don’t want to purchase spices just for this one recipe. And, while I completely understand that, once it’s in your spice closet, you are more likely to keep experimenting with it. However, you can also buy spices in bulk, ensuring that you grab just the small amount that you need. Some Whole Foods have bulk spice bins and our local co-op grocery store does. This biryani is such a show stopping dish. It’s gorgeous, studded with pistachios, golden raisins, mint and vegetables. I don’t know what your plans are for Easter, but if you’re looking for a different type of main dish, I think this would be perfect. My in-laws are coming down this weekend and while I haven’t yet decided what I plan on making, I could see this making the final cut. It’s just so pretty. 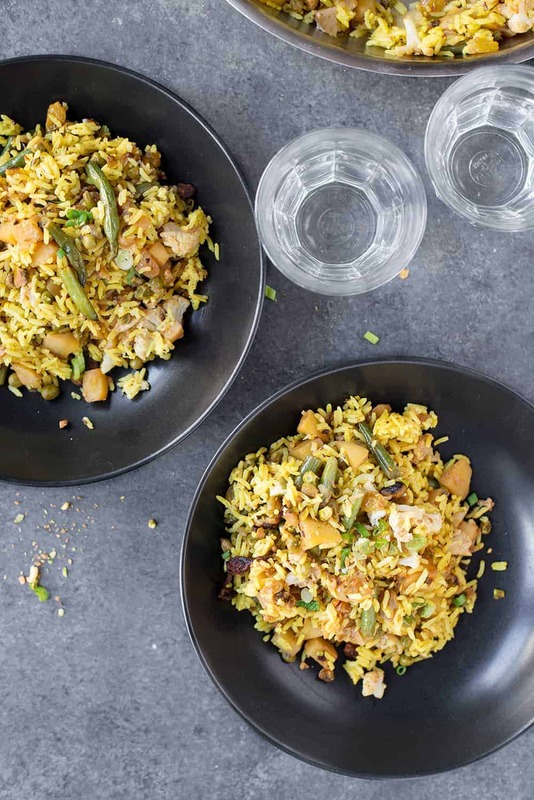 Vegan Indian Biryani! 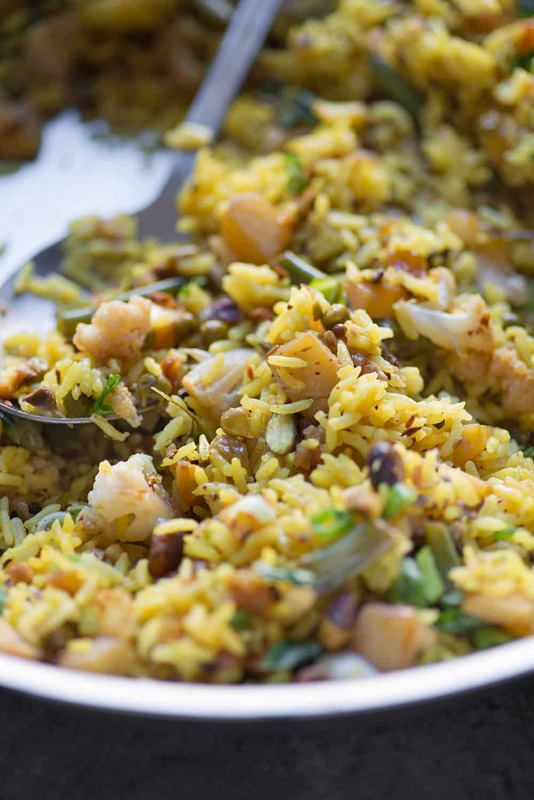 If you love Indian food- you’ve gotta try this healthy recipe! 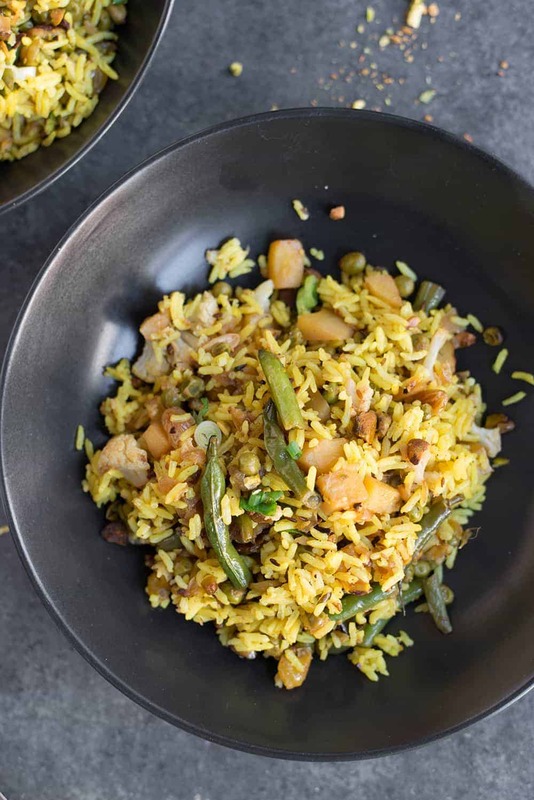 Flavorful spiced rice with lots of vegetables. Super easy to make at home and SO good. Rinse the rice in a bowl or sieve. Don’t skip this step! 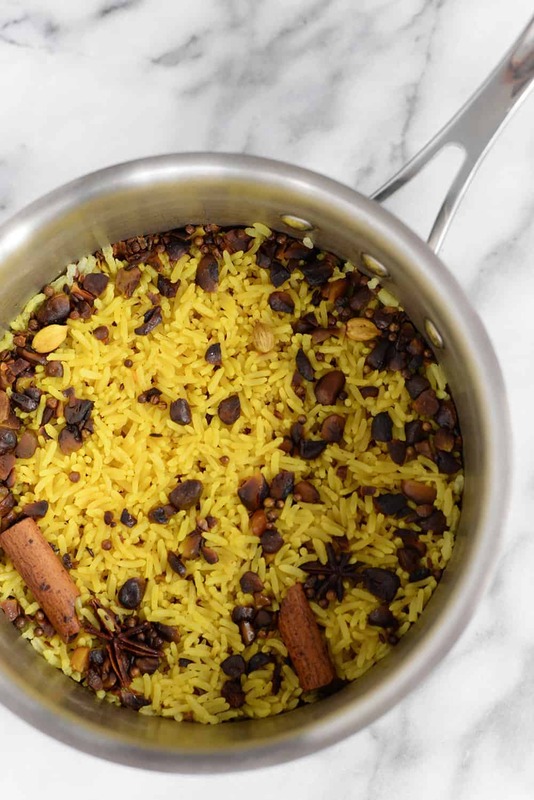 Rinses the basmati rice first prevents it from clumping as it cooks. Heat 1 tablespoon olive oil in a medium saucepan over medium heat. Add the pistachios, turmeric, 1/2 teaspoon cumin seeds, 1/4 teaspoon coriander seeds, 4 cardamom pods, star anise cinnamon and cook, stirring often until toasted and fragrant, about 2-3 minutes. Add the rinse rinsed rice and cook another minute until just toasted. Stir in 1 3/4 cups water and 1/2 teaspoon salt and bring to a boil. Reduce heat to low, cover and cook until rice is tender, about 20 minutes. While the rice is cooking, heat the remaining 2 tablespoons olive in a separate large skillet. Add the onion and cook until just soft, about 5 minutes. Add in the garlic, ginger, raisins, remaining coriander seeds, remaining cumin seeds, 4 cardamom pods and 1/2 teaspoon salt. Cook until spices are toasted and fragrant. Add in the green beans, cauliflower, peas, potatoes, and carrots along with 1/4 cup water. Cook, stirring often, until vegetables are tender. You may need to add more water; start with a tablespoon and go from there. Add the rice mixture to the vegetable mixture and stir to combine. Stir in the lemon juice. Season to taste with salt/pepper as needed. Garnish with extra pistachios, cilantro and mint. Excellent my family loved this!